The following interactive map is a snapshot of some of the foreign-born inhabitants of the parish of Govan in 1881. The map can be used in two different ways: to identify people by nationality and learn about their living and working arrangements; or to search for a surname amongst the sample. Govan first appeared in charters during the 12th century (although its history is said to date to the 7th century) where it is spelt ‘Guvan’ or ‘Gouvan’. The name itself is Gaelic in origin although its precise meaning is difficult to trace; George Chalmers, author of Caledonia (1824) suggests two possible meanings. In Gaelic the name can be translated as ‘smith’s town’ or alternatively (and far less romantically), ‘ditch’. We chose to use Govan in our research project as it was a large parish; by the early 20th century it was the second most populous parish in Scotland with a strong industrial heritage and boasted a melting-pot demographic of primarily working-class inhabitants. Industrialisation brought with it increased employment opportunities in the urban centres of Scotland, and a general rise in the standard of living. Changes such as improved sanitation and public health administration sat alongside the scourge of inadequate housing, hopeless poverty and urban ‘landscaping’ – the sort that saw the removal of hundreds of slum tenements to be replaced not with sturdy, spacious homes, but railway lines. One area that benefitted, in some ways, from the revolutionary change in Glasgow’s fortunes was Govan. Once a rural village, by the mid-to-late 19th century Govan was taking on the habits and trends of many towns in the central belt, that of an industrial locus. Industry was attracted to Govan’s location on the Clyde, which had been deepened the previous century, and it was during this period that its place as a centre of shipbuilding excellence took shape. By the late 19th century Govan was the 7th largest town in Scotland. Not only did the landscape of the town change but the population also changed, in number and form. In 1861 Govan’s population was dominated by Scots and Irish, who comprised around 98% of the population. The average percentage of Irish born for the whole of Scotland for 1861 was around the 7% mark, in Govan this was 18%. The peak for Irish immigration into Scotland had been in the years running up to, and immediately following, 1851, when as a result of the devastating potato blight that led to famine, 1 million Irish died and a further 1 million emigrated. In 1861 around 2% of the population of Govan was born in England. By 1881, Govan was beginning to attract an increasing number of Russians, Austrians and Poles: the first wave of Central and Eastern European migration, which would rise significantly in the following 20 years. What typified this latter form of international migration was that it was forced. These migrants were not decanting themselves to Scotland solely in the search for work – as English migrants had been doing – but this was necessitated by threat of harm, inflicted not by nature but by man. The infamous anti-Jewish pogroms in Russia which erupted regularly during the late 19th century were murderous in their scope, claiming the lives of between 2500 and 5000 Jewish men, women and children (the exact numbers of those murdered is difficult to estimate). Govan’s diversity is probably best demonstrated through reference to census statistics. In 1911, around 78% of the town’s population was Scottish born (which would have included second-generation Irish), 11% were Irish, around 7% were Russian or Polish, 4% were English and the rest were drawn from diverse backgrounds including, Austria, USA, Hungary, Germany, Turkey and France. In effect, over one fifth of the town’s population were not Scots born. The impact that immigration had on Govan is difficult to measure; undoubtedly there would have existed some xenophobia but immigrants brought with them particular skill sets and an adaptability that was vital for survival. They also impacted upon the roll-call of Glasgow surnames, many of which still exist today. This is despite the mangling of non-British surnames which occurred when census staff filled in their records struggling with phonetics along the way; tracing one family we found that their surname had changed 3 times in 3 censuses. The parish (or ‘Combination’, rather than the burgh) was extensive, stretching from Renfrew on its western border, north to Anniesland, south towards Shawlands on its southern border and east until Rutherglen. According to the census of 1881, the population of the parish stood at over 220,000, with the majority of the population drawn from the working classes. At the yearend around 2% of the population was registered poor (discounting dependants), and in receipt of relief from the parish, although a significantly larger percentage sought temporary relief throughout the year, with hundreds more failing in their applications for support. Due to its large population the parish played host to between 600 and 1000 marriages per year in the pre-war period, and in excess of 4000 births. 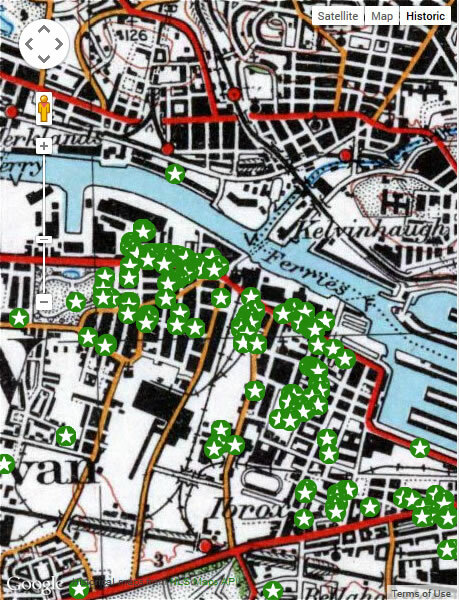 Govan Parish, therefore, was a perfect urban centre for us to use in our research project. It had a large population, a mixed demographic of largely working-class origin, and like most large conurbations, had a healthy turnover of marriages and births.